Will a decrease in stamp duty actually help first time buyers? Yesterday George Osborne delivered his autumn statement. 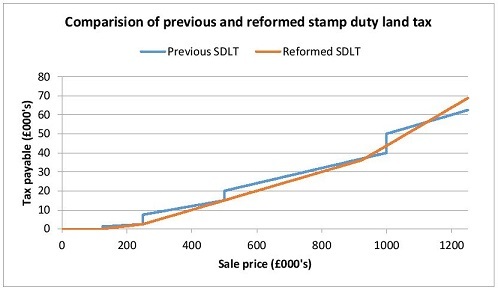 Perhaps the most significant reform is that of stamp duty land tax. Unsurprisingly this tax has been criticized by numerous interested parties for some time. The infamous feature of stamp duty was that the marginal tax rate exceeds 100% every time the price crosses one of the thresholds, because a single tax rate applies to the whole transaction. This tax has been labelled “Britain’s worst tax”, being distortionary and unfair. Reforms to stamp duty have been in the pipeline for years (my two pence worth), and this year Scotland announced its own overhaul of the tax. George Osborne’s reform eliminates the most objectionable feature – now the threshold will only affect the proportion of the property above it. The other change is to the rates of tax. The results are that most property sales below £1.125m will now pay a lower tax (and very expensive houses will now pay a much larger amount). On the face of it this reform appears to make sense. The purpose of most taxes is to raise revenue and redistribute wealth. Stamp duty does raise significant revenue – having recently overtaken revenue raised by tobacco taxes. Although this reform is expected to reduce government revenue by around £800m (approximately 12.5%), it is claimed to also benefit 98% of homebuyers. A first year economics textbook teaches us two important ideas about taxation: deadweight losses and tax incidence. The purpose of trade is to reassign property to the party who values it most. However, if the increase in value the buyer places on the property (above the seller) is less than the tax amount the sale won’t happen. When this happens the tax has resulted in dead weight loss. Tax incidence refers to the subtle difference between who is legally responsible for payment (in the case the buyer) and who in practice picks up the bill. The distinction arises because the buyer will take payment of the tax into account when deciding on her offer. If 98% of homebuyers pay less tax does this imply they are necessarily better off? Not necessarily. Focusing on these individuals (think 6, not 7, figure house prices), there are reasons which suggest this tax reduction might make them worse off. Current first time buyers are credit constrained: Many could afford the loan repayments on a more expensive property, but not the deposit. Since stamp duty cannot be added to a mortgage, the buyer must have enough for this tax payment in addition to their deposit. If the tax reduction gives buyers the opportunity to increase their deposit, banks might respond by permitting them to increase their leverage. This raises the possibility that a relatively small tax reduction might, via a multiplier effect, significantly increase house prices – making those buyers worse off. Best and Kleven (2013) have shown that house prices respond to changes in stamp duty by bunching at new thresholds. Removing the cliff edge will smooth the price distribution – and permit an increase in average house prices. Moreover, since the majority of transactions involve some bargaining, we should consider the introduction of taxes in this framework. Chae (2002) showed us there are situations in which parties can actually benefit from a higher tax! My own research into the UK housing market backs this up: suggesting that the cliff edge property of stamp duty provides such a benefit to buyers. First time buyers rejoicing in the belief they can now afford a house might be disappointed. If the most objectionable feature of the tax – the cliff edge property – has been keeping prices (across the whole market) down, perhaps homeowners not homebuyers should be rejoicing. Economics 101 teaches us that the legal and economic incidence of a tax is not the same. A tax reform intended to help first time buyers might paradoxically make them worse off, especially if it fuels house price inflation.